Click on the photo to see more pics! HPIM4545.JPG, originally uploaded by campdancer2000. The Runway for the Cure Fashion Shows at Mambo restaurant have been a great adventure! Thanks to Estrelita who asked me to provide entertainment for it, and to Marisol, the owner of Mambo, Kinki and Helsinki, who has been a gracious hostess to us! The ladies who came out with me benefited from the opportunity to get out and dance for strangers and friends in some cases, without the heavy obligation of remembering a routine. The crowds have been lovely to dance for, we could always find someone smiling and moving to the music to play along with. Thanks to Shade, Anastasia and Megan for joining me! And thanks to my Thursday Creative intermediate class for their patience and understanding…next week = full workout! 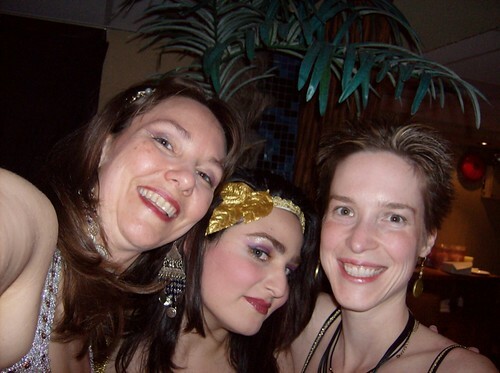 I have benefited by getting some more exposure for my own classes and for “Halyma’s Belly Dancing For Fun Dancers”, my business of providing belly dancers at events. An entirely new flock of people have seen how much fun it adds in a friendly, family oriented and yet still exotic way! And the event benefitted from entertainment and added energy to their fund raising – what a win win situation for all! Now for those paid gigs to start rolling in!